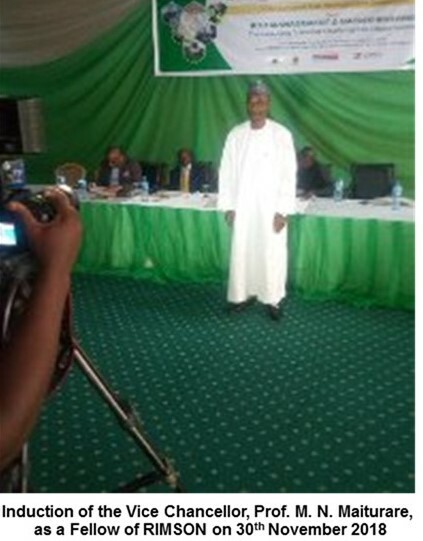 The Vice Chancellor of IBB University, Prof. Muhammad Nasir Maiturare, was inducted Fellow of the Risk Managers Society of Nigeria (RIMSON) during its 2018 National Risk Management Conference in Abuja. The Vice Chancellor was accompanied by the Director CASTER, Prof. Nuhu Obaje and the Director Consultancy Services, Alhaji Sulaiman Liman. RIMSON was established in 1985 as an association of corporate bodies and individual members dedicated to the advancement of Risk Management awareness and Risk Management culture in Nigeria. As an independent organization and membership association for Risk Management, RIMSON supports members in their professional development and execution of their roles, ensuring that the value of Risk Management is understood from entry level to bard level. RIMSON is a self-financing Society with membership cutting across all facets of the economy: Agriculture, Insurance, Manufacturing, Government ministries, Departments, Agencies and Parastatals, Banking and Finance, Oil and Gas and others. It promotes and influences further development of recognized Risk Management qualifications, driving research and market efficiency in commerce, industry and the public sector. Below is the citation of the Vice Chancellor, Prof. M. N. Maiturare, read at the occasion. A Fellow and Council member of the Institute of Actuaries Nigeria, Prof. Maiturare graduated from Ahmadu Bello University, Zaria with a B.Sc. Actuarial Science degree in 1985. Born on 16t June, 1963 at Paiko, Niger State, he also holds an MBA and a PhD in Business Administration. In addition, he obtained Certificates in Computer Hardware and Database Management from IMC New Delhi and IIT Bombay in 2001. Prof. Maiturare has been a Lecturer at the Department of Business Administration from 1987 to 2014. For over two decades, he had been the leader on Actuarial courses and pension in the Department. He has written extensively on different areas of Actuarial Science. Furthermore, he enriched his practical knowledge and expertise on actuarial discipline with a one-year Sabbatical leave at the National Pension Commission (PenCom) in 2013. He is a member of the Advisory Council of Experts, Jaiz Takaful Insurance Plc. from September 2015 to present. In the course of his actuarial career, he has written scholarly articles in the fields of Actuarial Science and Islamic Insurance as well as attended several conferences, seminars and professional development programmes. Prof. Maiturare served as technical consultant on Actuarial Consultancy projects for NNPC, PenCom, PFAs, NAICOM, Corporate organizations, Federal and State Agencies, etc. Prof. Maiturare has, in recent times attended international conferences and professional development programmes in the UK, USA, Germany, Malaysia, Ethiopia, South Africa, among others. He is also a founding member of the Academy of Management Nigeria. Over the years, he held key Management positions in the University system; Head of Department of Business Administration, Dean of Faculty of Administration, Director, Institute of Administration. Beyond the Academic environment, Prof. Maiturare had garnered valuable experience serving in Boards of private and public institutions as well as Governing Councils of State and Federal Universities. Currently, he is the V ice Chancellor of Ibrahim Badamasi Babangida University, Lapai, Niger State.